This tutorial will show you how you can create a nice candle light effect. It is written for DeleD 1.6, so some things may have changed since. First, we will create the materials we will be using. In this tutorial, all objects will have colors instead of textures. Of course, you can handle it as you want to. Enter the material editor and add those colors to the material list. Next, we need the texture for the flame. If you can't find or create one yourself, you can take this texture. Now, all materials are set up and we can start building. 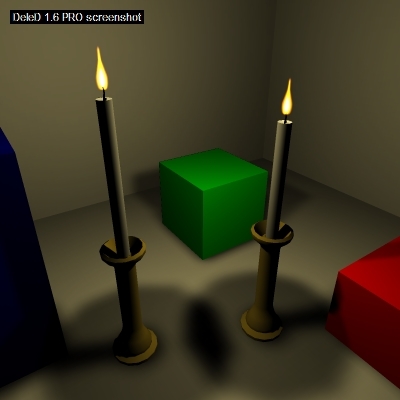 Create the golden candlestick. 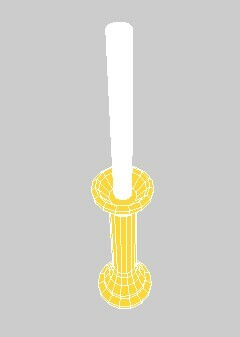 I chose a simple stick made of extruded cylinders. 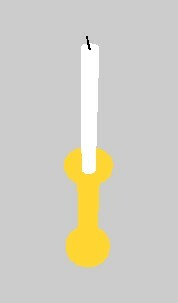 Now add a white cylinder on the candlestick, it will be our candle. I added a little black cylinder on top of the candle for the wick. Now that we have created the candle, we can create the flame. For DeleD does not support billboarded polygons, we need to think of another way of the flame facing towards us. Fortunately, there is an easy way for us to do this. 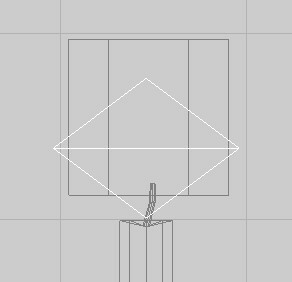 Create a square rectangle in the front view. Select the face, select 'Gen. UV' check 'Fit texture size to face' and hit 'OK'. Now, the square displays the entire texture. Go to object mode. Select 'Clone'. Enter 2 for 'Number of copies' and 60 for 'Y rotation offset'. Now, you should have 3 polygons shaped like a star. You might merge them. This star thing is important, because otherwise, the flame would be visible only from one side. If you saw it in another angle, it would seem flat and destroy the illusion. Put the flame on top of your candle. Now, we need the candle to actually emit light. 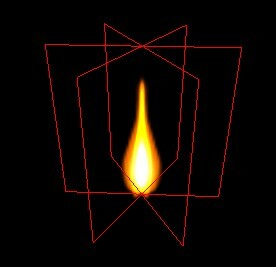 Thus, create a point light and put it on the same space as the flame. 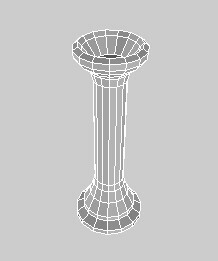 Open the object inspector fot the point light. Chose a slightly yellow/golden diffuse color, like 255/235/155. Leave the specular color white. The values you enter for the other fields, like Constant/Linear/Quadric or Range depend on your scene. Take a look at the lightmapping tutorial for that. That's all for the candle. Go for the lightmapping and adjust the parametres of the point light. Be sure to turn off culling (F5), otherwise the flame won't be fully visible.